Agritourism, an experience that combines traditional agriculture with tourism, is becoming increasingly popular throughout the state. With 4.5 million acres of cropland and diverse agricultural sectors, Georgia offers an assortment of agritourism sites and destinations that visitors are sure to enjoy. From corn mazes to pick-your-own veggies, it’s a great way to enjoy the outdoors and to teach your children where their food comes from. The Georgia Department of Agriculture initiated an agritourism program in 2008 that issues road signs to qualified agritourism operations throughout the state. These sites are designation by green directional signs along state highways in an effort to promote Georgia’s agriculture and tourism industries. 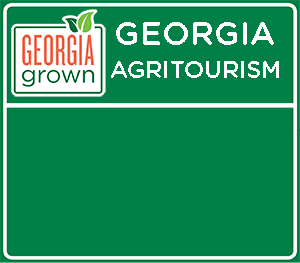 These signs provide visitors the opportunity to identify and enjoy Georgia’s thriving agritourism operations. The sites listed below are the many qualified agritourism sites that Georgia has to offer. If you have any questions concerning Georgia Agritourism sites please contact the Marketing Division.